Nearly daily, scientific evidence has been surfacing in support of the existence of an actual addiction to food, and at the same time more people in the US and other countries have admitted to be suffering from some form of food addiction. We have to admit that we all enjoy a snack or some delicious treat, but how can someone determine whether they have a more serious problem and whether they are actually suffering from food addiction? Well, there are several symptoms which could be a telling sign that something is wrong with a person’s relationship with food. According to experts who deal with this type of addiction and with patients who suffer from it, the symptoms can affect the person physically, socially, emotionally and spiritually. The physical symptoms of food addiction include: the inability to control cravings and the amount of food which is consumed; the constant experimenting with fad diets, weight loss plans and yet continuing to consume more food than is healthy; suffering from a food disorder, including forced vomiting and using laxatives or extreme exercising to purge the organism from the extra calories and to avoid the weight gain from the over-consumption. Junk food. Photo credit: colros, CC BY. The physical symptoms may lead to weight gain, obesity and diseases associated with it, as well as the opposite – malnutrition and physical problems with constant purging of nutrients to mention just a few of the harmful and dangerous side effects of this addiction. The social symptoms which may be a sign that a person has a form of food addiction include: secret eating, avoiding social contacts because of inability to control eating habits, or because of lowered self-esteem because of weight gain and lack of fitting clothes to go out with. Other social symptoms may include: actually stealing food from others or being overly obsessed with the food which is served and consumed when at a social gathering. As for the emotional symptoms, they could include: feeling embarrassed and ashamed for one’s weight, and depressed because of one’s self-image. Emotional symptoms of food addiction can also include a sense of hopelessness to cope with excessive weight, overeating when depressed or as a self-award, or feeling over-anxious when not eating or eating certain types of food. The results from survey, performed on 8 typical symptoms of food addiction, to which 875 people with known addiction or an unhealthy relationship with food responded, showed that people, who suffer from some form of food addiction, often suffer from uncontrollable from cravings even after having a full meal. This craving has nothing to do with hunger or the need of nutrients and energy for the body, but rather is associated with the dopamine which is released by the brain. There is a correlation between food addiction and the brain reward system. Some experiments have concluded that the brain reward and pleasure centers are activated following the intake of highly addictive drugs, such as cocaine and heroin, as with the consumption of foods which are highly palatable, namely foods which are rich in: sugar, salt or fat. Another common symptom among food addicts is overeating, and more so the case of experiencing “all or nothing” where just one snack, one piece of cake or just one portion of food is never enough. In fact, 40% of the food addicts claim that they frequently overeat and cannot stop eating, and more than 54% admit to often eating more than they intend to. One more common symptom, which people with food addiction admit to be experiencing, is eating until feeling absolutely stuffed. 36% of those surveyed admitted to frequently eat until feeling excessively stuffed or in other words – practice binge eating. The feeling of guilt after eating a food or snack, which they are not supposed to, is yet another of the bothersome symptoms of food addiction. Only 19% of those addicts surveyed admit that they rarely or never feel such guilt after binge-eating or eating “forbidden” foods. With compulsive eating there is almost always guilt after binge eating. Another symptom which has been found to be commonly found among food addicts is the tendency to make up mental excuses to strive away from a diet, or to eat some forbidden snack or junk food. 30% of the people with food addiction make up these excuses to eat food they are supposed to abstain from all the time, and about 40% can relate to this phenomenon. Like in almost any other person, food addicts have difficulties setting their own rules for themselves, and even more obeying them. 31% of the people with food addiction in the survey admitted that it happens frequently, another 31% admitted to sometimes have difficulties keeping their own rules about food and eating, and more than 18% confessed that they experience this constantly. Yet another symptom of food addiction found to be prevalent among the people who participated in the survey is actually hiding the consumption of junk food or food in general from other people. Often, food addicts eat late at night, in their car, or out of the sight of their loved ones and friends. The reason is mainly a general embarrassment of the weakness to withstand from eating food they are not supposed to. 26% of the people said they do this frequently and 25% admitted to eating secretly sometimes. Another of the social symptoms of food addiction is actually stealing food from other people. Unfortunately, as in any other addiction, it is very difficult to stop eating bad foods or overeating or any other excessive behavior associated with food addiction even when the physical and health problems become apparent. The chronic overeating and indulging in unhealthy snacks and foods can lead to serious health conditions and obesity, type II diabetes, heart disease, dementia and Alzheimer’s and even cancer. But more than 50% of the food addicts when asked admitted to have serious trouble controlling their eating despite the physical problems they are experiencing (weight gain, obesity and other health issues). A worrying result of food addiction is the development of a tolerance to food, which causes overeating and eating more and more and at the same time feel less and less satisfied. The problem, as in any other addiction, is that food addicts may experience physical withdrawal symptoms such as anxiety, agitation and other physical symptoms when they cut down on certain foods. So, it is actually one of the addictions which are very hard to break. Thankfully, there are a growing number of experts, support groups, associations and forums which are available to help a person in need of resolving their food addiction. A huge problem is many Americans don’t put in the necessary time and effort to work out and eat correctly. Preparing food correctly can take time but it will result in much better health. This country would be much better off if more people completely stop drinking soda and eating fast food. There are too many foods that contain the exact amounts of sugar, fat and salt to be literally addictive resulting in obesity. This is definitely by design, not a mere coincidence, but try this: One 60 kcal cookie a day over time. See what happens in 5 to 10 years. You’d be amazed! What wimps the American people are. One robbery in town and everyone panics. One hijack and we go thru hours of secuity. One child molester and parents go nuts and the child can’t ever forget. We need a strong leader to take charge and let the poeple know the truths of life, not the fears. As for obesity, eat less! Irony – poor people are more obese than non-poor. 100 years ago, being skinny was a [general] sign of poverty. One reason why obese Americans are usually those with lower incomes, is because cheap food here is processed food – which is loaded with salt. 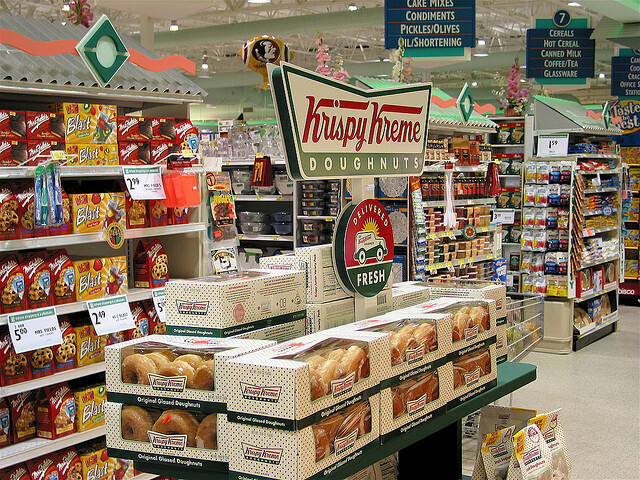 In order for the obesity rate in this country to be lowered, the price of more healthier foods needs to be lowered a great deal. Poverty and obesity are related in a vicious cycle for 2 obvious reasons that I can spot right away – and no doubt many more that studies will tease out of the data for a good long time to come. The first is that poverty necessitates dependence upon assistance such as SNAP to feed the family and almost every one of those stories we’ve read and written about politicians attempting to live on foodstamps for a month emphasizes that it’s nearly impossible to “get filled up” on $2 a day. You are forced to go for low cost/high calorie choices. The second reason is that poverty – and its institutionalization – is endemic among states which have lower regard for public education and tend to want to voucherize access. Over the past 30-odd years, science and health classes have slipped out of the curricula to the point of no longer teaching proper nutrition to children. Physical education is no longer required or taught. All of those things add up to too many calories consumed and too few of them burned off. From what I’ve also gathered, there’s emotional and social causes too. People who are generally happier tend not to look to food as a source of emotional support/supplement. People who are higher on the social ladder, tend not to be looking to fill an emotional void, or rather find it through other sources. Heavy weight is also used a defensive mechanism from mental trauma. In short, some large people eat a lot because they want to be happy or feel safer. And you can’t fault them for that. I also don’t want them to feel guilty for it. If they want to eat… by all means. I don’t want to stand in the way of anyone’s path to happiness, even if I don’t think its the best one. I totally agree with you on the physical education thing, too. There is research already to support your statements, Andy. You make good points. Some new research indicates some genetic predisposition toward easier weight gain and/or retention of weight – which is also a contributing factor. So is learned behavior. So an overweight family is going to have a terrifically difficult time with all sorts of problems related to mental and physical health – even if poverty isn’t an issue. I frequently eat a food stamp diet ($5/day for a single person) and easily have enough money left over at the end of the month to enjoy not only organic whole bean coffee with half-and-half daily, but one or two gin and tonics every night (bottom shelf gin). Staples, which I buy at Walmart, are whole grains, beans, canned tomato products, eggs, lots of fresh vegetables and fruits (in-season, non-exotic), extra virgin olive oil, and spices. Those publicity seeking politicians are apparently as incompetent at spending their food money as they are at spending taxpayers’ money. Specifically – a pound of dried lentils costs about $1 and has about 1600 calories, brown rice is about the same. Nobody in my neighborhood lives in poverty. However, we’ve got a kid in the neighborhood who is most definitely obese. His parents aren’t morons, either. His dad at least is a college graduate. But, the kid is spoiled rotten. He’ll eat a pizza by himself – and then spend a few hours playing video games. Perhaps it’s not the poor people in poor states who are fat? Just a thought that occurred to me when I read this. As long as Big money is being given to the fake food makers (high fructose corn syrup and other processed food makers) dieting will not work. Fake foods have made us all insulin resistant. Dieting will not work. This picture is super problematic and really fat-shaming. 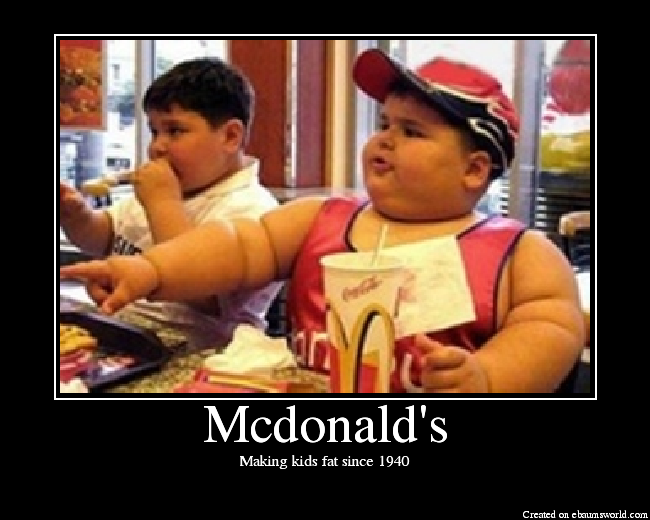 It’s great to have a conversation about poverty and health, but do we have to show a picture of two obese children eating McDonalds to do it? It’s a photo of a fat kid – the subject of this article. What’s “problematic” is that there actually ARE kids who are this fat. Not that there are photos of them. Oh, and also people who find reality “problematic.” That’s problematic. It was a very appropriate picture. It’s absolutely ridiculous that you were somehow offended by it. Study the historical documentation of nutrition found in food today compared to what it was 70 years ago, and you will find the answer to obesity in this nation. We have to eat twice the calories and often more to get the same nutritional value to fuel our bodies. This is the result of corporate farming, the use of chemical fertilizers resulting in nutrient soil depletion. In short, if the nutrient is not in the soil, it is not going to be in the food. And then there are all of the “special interest” groups. As long as they control the food charts we will continue to have obesity challenges.